You can call him what you please. But if gambling rackets, crime, and murder stories of years gone by are the skewed ideology of romance, then fellas like Humphrey Bogart, Cary Grant and Gary Cooper were the silver screen’s pale imitations of leading men. No one made for a more sinister romantic character of the early 20th century than Arnold Rothstein. So much so that he was a major influence in Damon Runyon’s Guys and Dolls. He was the inspiration for Jay Gatsby’s crooked associate Meyer Wolfsheim in the novel The Great Gatsby. And his famous pool playing marathon against Jack Conway inspired the opening scene to the movie The Hustler. Arnold Rothstein was a well dressed, mild mannered, milk drinking thug. Born of well-to-do immigrant parents in 1882 he was the second of five children. He grew up in a home wanting for nothing except the affection of his parents. That didn’t happen. With the untimely death of his older brother Harry, Rothstein made an attempt to smooth things over with his father. One argument later and it all went to hell. Rothstein didn’t fall into the typical Mob boss stereotype. For one, he was born in the United States; a rarity then. He was never one to smoke cigarettes or cigars or drink booze and women found it charming that he’d choose to drink milk over whiskey. In 1904 Rothstein was 21 when he arrived at Saratoga for the first time via the Cavanagh Special. Like many (read: all) he fell in love with its charm immediately. And I don’t mean just the grand Victorian homes, the large lush pines and the historical brilliance of the village. I mean the chumps, the hapless and mindless plungers with money to throw away and the poor sucker looking to get a lucky break spinning a roulette wheel. On August 12, 1909 at 185 Washington Street in Saratoga Springs he married former showgirl Carolyn Green. They celebrated their wedding night by Rothstein making off with his new bride’s jewelry, pawning it and using it for bets. His mother and father, a devout couple of the Jewish faith, did not attend because Green refused to convert to Judaism. During they day Arnold and Carolyn would go to the races. She’d be dropped off and he took action. At night she stayed home while he hit the casinos. The honeymoon ended, not too coincidentally, as the race meet did. Rothstein made 12 grand at the races that meet and got his wife’s jewelry out of hock. Ever the romantic, Rothstein would take his bride to Saratoga every year to celebrate their anniversary. However, their vacations at the Spa mirrored their honeymoon and were spent separately. 1919 was a busy year for Arnold Rothstein. He opened The Brook; a casino on the outskirts of Saratoga Springs. A couple of months later he was the accused ringleader in the infamous “Black Sox” scandal. But there was never enough proof to grant an indictment on Rothstein. Believe what you want to believe but one thing was certain about Rothstein, when he bet, he bet big stakes on sure things. Which leads us to the 1921 Travers and one of the more “romantic” (read: notorious) stories of Arnold Rothstein. The oldest stakes event in North American racing, the Midsummer Derby has drawn some of the greatest three year-old’s ever to set foot on dirt. Back then horses could be entered to run the same day, up until 12 noon. They could even be scratched by a trainer 30 minutes before post time, without cause or explanation. As the owner of Redstone Stable (but more likely because he was a learned gambler) Rothstein was aware of both rules. The favorite was a filly named Prudery, owned by Harry Payne Whitney. No one figured they could beat her so no one else entered. Rothstein believed second money is better than no money so his horse, Sporting Blood, was listed to run. With no one else in the race it was the closest thing he’d get to a sure thing in racing, at least second money. It was even rumored that he had no intention of betting on the race. Rothstein knew his horse was improving in form, and with the information he had on Prudery he began to think he might have had a shot. On Travers day the filly had not improved any from the days before, but she was still going off at odds of 1 to 4. Sporting Blood was a generous 5/2. Just before the close of entries at noon, a leading trainer named Sam Hildreth entered his top 3-year-old Grey Lag into the Travers. Hildreth was a very successful trainer who amassed $1.2mm in earnings over four years as a conditioner. He also had a proclivity toward gambling. Grey Lag rivaled the Alabama winner, Prudery, on the odds board as the Hildreth charge was accomplished in his own right. Sporting Blood was all but ignored at this point. Maybe, just maybe, Sporting Blood would have a shot against Prudery on his best day and her on her worst. But Grey Lag? No. Not a chance. Rothstein contacted his “agents” immediately after learning of the entry and placed $150,000 worth of bets on his own horse. The bookies thought it was easy money, so much so they didn’t even make him wire the money to them. Rothstein, smartly, didn’t play his horse at the track knowing he’d manipulate the odds. Besides, there was no information let out he had plunked a hundred and fifty grand elsewhere. But why would Rothstein lay a hundred and fifty grand on his own horse when a third and markedly better thoroughbred had just entered the fray? This was seemingly the furthest thing from a sure thing imaginable. With 30 minutes to post for the Travers Stakes, Hildreth “unexpectedly” scratched Grey Lag. Ah. Now I’m getting’ it. No reason was given for the scratch. Hildreth’s actions fell precisely within the scope of the racing rules. Dazed and confused, racing fans and bookmakers alike didn’t know what to make of the sudden entry and then departure of Grey Lag. Hildreth volunteered no explanation, keeping his reasoning to himself. And then there were two. Again. The odds hadn’t changed much on track. The Grey Lag money went toward Prudery. And remember, Rothstein’s money went elsewhere, secured at odds of 3-1. When they broke from the gate Prudery did as she was expected to do. She took the lead. She led for the first mile but never by more than a length. When they hit the quarter pole all the conjecture, speculation and inside information Rothstein received on the filly started to come to fruition. Slowly and surely Sporting Blood came to terms with Prudery before drawing in front by a head, then a neck, then a length. When they crossed the wire Sporting Blood was a clear two lengths to the good of the odds-on favorite. Arnold Rothstein, a notorious gambler and often assumed but never convicted criminal, spent $10 to get inside information on a horse. 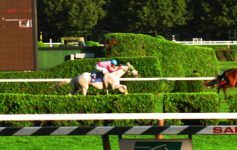 As a result he won the most prestigious race in Saratoga Springs. He collected $450,000 in winning bets from bookies. Lest we forget the $10,275 purse. Not unlike the Black Sox scandal, there was never any proof – just conjecture and speculation – that tied Rothstein to a scam. There was never any proof that Hildreth took a dime from Rothstein. Nor was there any proof that the two conspired. After all, A.R. had professed, under oath in a court of law how he has never been connected with a crooked deal. He was under oath, after all, so why not believe him? A gambler of his status wouldn’t lie, would he? Probably because an exorbitant amount of money was wagered on a horse in a race where it didn’t seem likely he had much of a shot. Probably because it was his horse. Probably because Rothstein stood to make nearly half a million dollars as a result, and did. … and no one dared to mess with the likes of Arnold Rothstein. The entry in the history books covering the 1921 Travers is one that will forever be marred by a betting scandal with the notorious Arnold Rothstein. And with that, he will forever hold his place secure as one of the more infamous, and not to be confused with beloved, characters of Saratoga lore. from David Pietrusza’s: ROTHSTEIN: The Life, Times and Murder of the Criminal Genius Who Fixed the 1919 World Series. 1904 – Makes first trip to Saratoga aboard the Cavanagh Special;strands Abe Attell. 1909 – Marries Carolyn Green at Saratoga Springs; pawns her jewelry (August 12). 1917 – Begins bankrolling Saratoga gambling house owner Henry Tobin. 1919 – Opens The Brook in Saratoga Springs. 1920 – Subway Sam Rosoff loses $100,000 in one night at The Brook (August). 1920 – Rothstein wins between $850,000 and $900,000 on Sailing B (August 27). $450,000 in winning bets (August). 1922 – Sells The Brook to Nat Evans (alternate date: 1925). 1934 – Evans insures The Brook and its contents for $117,000 (November 1). 1934 – The Brook burns down (December 31). Nice story, Patrick. I really enjoyed reading it.